Tonight's 2018 Golden Globes will be unlike any other. In part, because of the Time's Up initiative, a movement and legal defense fund launched to prevent sexual harassment in the workplace and beyond. 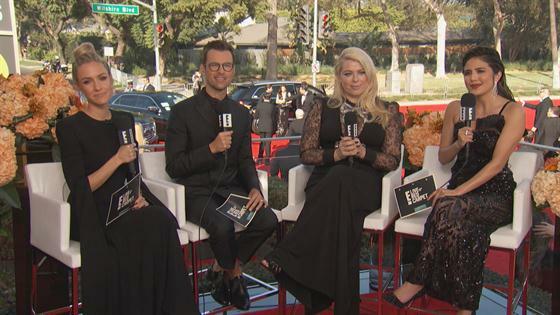 Founder and CEO of Girl Gaze Amanda de Cadenet appeared on E! 's Countdown to the Red Carpet to touch on the importance of Time's Up and why some of your favorite celebrities will show their support by wearing black to the ceremony. "The Time's Up Movement is the current representation of the women's movement, which has actually been going for a really long time," de Cadanet explained. "Before Time's Up there was #MeToo, and before that there were generations of women that have been fighting for this moment." Amanda shared, "Time's Up is an incredible amalgamation of years and years of these women's work, plus many influential women in Hollywood who have gotten together and said, ‘We collectively, our voices, have the power to create positive change. Between legislation, between policy change, between this incredible fund that has now reached more than $15 million dollars...'"
The Time's Up Legal Defense Fund was announced New Year's Day. In addition, the movement launched the Commission on Eliminating Sexual Harassment and Advancing Equality in the Workplace in mid December, which seeks to create safe and equitable work environments. Furthermore, Time's Up works with 5050by2020—a movement in which women, people of color and LGBTQ members in the entertainment world fight for fair hiring practices and equal leadership representation. "I'm personally so excited what's going to keep going here," she added. "If they've done this in this short period of time, it's going to be exciting." Those set to dress in black for the Golden Globes include some of Time's Up biggest supporters like Kerry Washington, Reese Witherspoon, Alyssa Milano, Tracee Ellis Rossand more. Others will sport a Time's Up pin designed by Arianne Phillips, which de Cadanet explained are for those "who want to share their solidarity and already bought their outfits, and/or were not able to wear black for whatever reason." de Cadenet described this decision a "celebration of sisterhood," adding, "The reason why black was chosen, to my understanding, is that everyone has something black in their wardrobe. Not everyone has something yellow, for example. It's really not about showing anything but solidarity with our sisters and it's unifying. This is really a time to get together and support one another." She added in part, "It's a real beautiful unity and message to the world, which is that, 'Time is up. We're ready for change. We're all on board for this.'" de Cadenet also expressed the need for policy change, legislation, and a "guarantee" from corporations of all sizes to ensure that "if anybody experiences assault or prejudice in their companies that there is accountability." She concluded, "There's a lot to be done and it's only just begun. This is a long road. It's been a long road to get here. It will be a long road to create the kind of lasting, impactful change, but I would say they've made an incredible dent in such a short period of time."